Mesothelioma is a rare and aggressive form of cancer caused by exposure to asbestos. Because Virginia is divided by the Appalachian Mountains, the state has a large number of natural deposits of asbestos, and it has been discovered in at least 24 of the state’s counties. Virginia has a high rate of mesothelioma deaths in comparison with other states and ranks 11th in the country for asbestos exposure and mesothelioma deaths. Virginia is home to many of the industries that put employees and their families at the highest risk of asbestos exposure because asbestos was an integral part of these industries from the late 1950s through the early 1980s. When tiny fibers of asbestos became airborne, workers exposed to this toxic substance could swallow or inhale the fibers. These fibers would become trapped in the linings surrounding many vital organs such as the lungs, heart, and abdomen. People who worked around asbestos also brought the fibers home on their clothes, and their spouses and children also became exposed to harmful levels of asbestos. This type of asbestos exposure is almost always the cause of an aggressive type of cancer known as mesothelioma. It can take decades for symptoms of mesothelioma to develop —between 20 and 50 years. Often, symptoms do not emerge and a diagnosis is not made until the cancer has progressed to a more serious stage of the disease. However, if you live in Virginia and are ill with mesothelioma, you have a number of good treatment centers within the state where you can obtain the medical treatment you need. Mining. 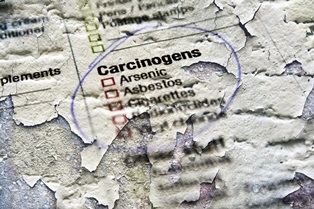 Because of the abundance of natural asbestos in Virginia, it has been mined in the past. Workers could have been exposed to asbestos while mining it and through the components of equipment made with asbestos. In addition, other mining operations such as coal and talc mines also exposed workers to asbestos. Virginia Vermiculite in Louisa County operates one of the last vermiculite mines in Virginia, and high levels of asbestos have been found in some rock samples. Shipyards. Asbestos was used in the construction of ships and in shipyards until the early 1980s. Lyon Shipyard, Norfolk Naval Shipyard, and Newport News Shipbuilding—one of the largest shipyards in the country—are a few of the shipyards in Virginia where large quantities of asbestos were heavily used in shipbuilding operations. Power plants. One important property of asbestos is that it’s a good insulator against electrical currents. As a result, it was widely used in powers plants in Virginia, including Potomac Electric Power Company in Alexandria, Virginia Electrical Power Company in Richmond, and Dan River Power and Manufacturing Company. At Surry Power Station, its pipes contained asbestos and endangered many workers. In addition, at least 11 contractors were exposed to asbestos in 2011 when they repaired the nuclear power plant after a tornado. Military. Veterans in the U.S. Navy, Coast Guard, and Marines in Virginia have a higher risk of developing mesothelioma. Sewells Point Navel Complex in Norfolk and Naval Amphibious Base Little Creek in Virginia Beach are just two facilities where veterans have been diagnosed with mesothelioma. Dr. Ryan Gentzler, Dr. James Isbell, and Dr. Christine Lau are physicians at the University of Virginia Cancer Center who treat patients with mesothelioma. Besides obtaining the medical treatment you need for your disease, you may also want to join a support group for a place to share your challenges and to help you feel less alone. You may be able to find a cancer support group through the medical center where you are receiving treatment such as the University of Virginia Cancer Center. Additionally, the Mesothelioma Foundation and the Mesothelioma Guide Facebook page offer online support groups for mesothelioma patients. If you worked around asbestos and received a diagnosis of mesothelioma, you may have a legal claim for compensation against the employer or other negligent party responsible for your exposure. However, you must file your lawsuit within Virginia’s statute of limitations, which is the deadline you have to file your complaint in court. Under Virginia law, this deadline is two years from the date of your diagnosis. If a family member died from this cancer, the statute of limitations is two years from the date of his death. Proving that an employer or other party was the cause of your mesothelioma can be complicated, especially since you may not be diagnosed with this disease until decades after your exposure to asbestos. Our experienced mesothelioma attorneys are here to build your claim of negligence and to fight for the compensation you deserve for your expensive medical treatments, lost wages, and pain and suffering. We handle these cases on a contingency fee basis, which means you will not owe any attorney fees until we settle your claim or win your case at a jury trial. We understand how debilitating mesothelioma can be and are willing to come to you if this makes it easier for you to pursue your legal rights. To learn more, contact us online or call us directly at 318.588.6393 to schedule your free, initial consultation with our experienced mesothelioma attorneys.